Fresh Dan Snaith (aka Caribou (aka the artist formerly known as Manitoba)) has a Phd in pure maths. When that chunk of knowledge wins you Who Wants to Be A Millionaire, we want 35%... 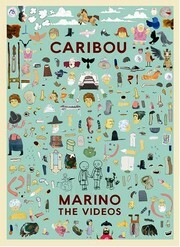 Primarily a DVD release of short films made to accompany Caribou's live show, 'Marino' also includes a bonus CD culled from the 'Milk of Human Kindness' sessions and previously only availble on a gig CD affair. With the videos all produced by Delicious 9 (who have some kind of link to Shynola we're reliably informed), Caribou's last two LP's are well represented; featuring animations for the likes of 'Yeti', 'Barnowl' and 'Hendrix With KO'. Of the new songs, both 'Marino' and 'The Barn' are of particular note, while the package is also accompanied by a lavish booklet and housed in a hardback case. It seems Snaith's done the math!